Revit Fix: Tips on using Structural Beams. Tips on using Structural Beams. Since the improvement in Revit Architecture 2008 I have been encouraging users to use proper structural members in comparison to previous workarounds (ie floors as concrete beams). Drawing proper structural columns and beams in designated structural plans is just so quick to draw and more importantly edit and when tagged, allow coordination to be a breeze. Here are some tips the help modelling run smoothly. 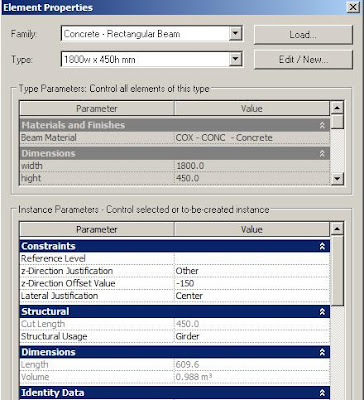 Before you draw any beams select the beam type you want and then go into it’s properties dialog box. Ensure you are drawing it on the right level. It is support the level 2 floor slab, make sure it’s reverence level is set to level 2. You have four options here: Top, Center, Bottom & Other. The first 3 are obvious, the Other setting is the Top with the option of an offset which is filled in, in the below parameter. (Z-Direction Offset Value). Only enabled when the Other parameter is selected in the Z-Direction Justification. If you do need to offset your beam, first preference is to use this setting. i.e. your beam is 150mm below FFL. Avoid using the “Start and End level offset” setting if possible as they can trow up errors messages when coping or moving beams later on. The location of the Justification of the beam. You have 3 options: Center, Side 1, Side 2. When using most beams Center Justification will work. 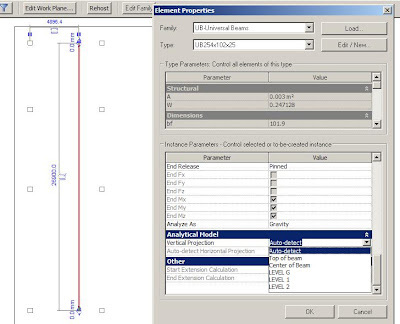 When using concrete slab parameter beams use Side 1, or Side 2. Tip: By using Side 1, if you draw it anti clockwise around the slab parameter, the beam will be on the floor side (in-side). If all users only use Side 1 in these circumstances, you can always know how the beam will modify when changed to a different size or the geometry changes. This is the other item worth making sure you get it right. Selecting if the beam is: a girder, horizontal bracing, joist, or a purlin, will assist in your visibility graphics setting control. Problems with Visibility with steel / timber beams. There are some beams you may draw, and you end up finding them visible on levels there they are above the view dept. This is to do with the reverence level it is drawn on, but sometimes this is not avoidable. The work around is to select the beam, go to it’s properties, Under Analytical Model, change it from Auto-detect to Top of Beam.